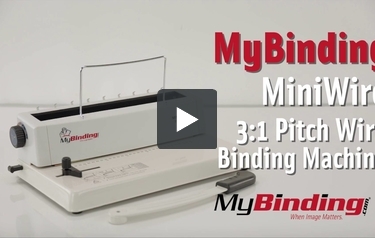 The Mybinding MINIWIRE manual wire binding machine is perfect for the home office or occasionally coil binding. The MINIWIRE offers you a high quality inexpensive alternative for wire binding your documents into a personal professional finished presentation. The MINIWIRE punches 3:1 pitch square holes in up to 12 sheets of 20lb paper at a time. This manual wire binding machine has an adjustable depth margin and can bind documents up to 9/16” thick while also featuring a compact design. The wide variety of color wire and covers available at Mybinding make it easy to customize your documents and brand, with the addition of the Mybinding MINIWIRE this is now an affordable possibility for anyone. Punches 3:1 pitch 32 pin square hole pattern. Punches up to 12 sheets of 20lb paper. Manual punch for wire binding. Includes waste tray and wire selector. Transcript: Welcome to MyBinding.com. This is the MiniWire 3:1 Pitch Hole Bunch and Wire Binding Machine. Welcome to MyBinding.com. This is the MiniWire 3:1 Pitch Hole Bunch and Wire Binding Machine. Whether you're binding daily, monthly or yearly, this affordable machine makes wire binding simple and cost effective for you. All MyBinding’s machines are made with high quality, long lasting materials and are backed by a two year warranty for peace of mind. Start by removing the thumbscrew on the right side, slip on the handle and replace the screw. Adjust the left edge stop for the correct size paper and rotate the knob on the left side to the punch position. Then you can punch up to 12 pages of 20 pound paper. There's an easy 11 inch guide for standard paper, and the punch holes are numbered. This particular machine makes 32 square holes standard for wire binding spines. The tab on the left side of the machine is used to set your margins depending on the size of your booklet. Don’t forget to periodically empty the waste tray. Set your binding wire on the hooks on the back of the machine so you can set your pages into the wire as you punch. Once you’re done punching your pages and covers, take the booklet and set it wire down into the crimper. Set the knob to the correct size wire you’re using and depress the lever one last time. You’ve made a perfect wire bound booklet all on your own. Stop paying expensive labor and make perfect booklets on your own time with MyBinding's line of hole punch and binding machines.